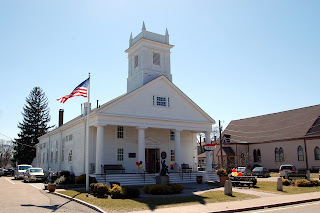 The Franklin Historical Museum will celebrate Horace Mann, Franklin’s favorite son, on the occasion of his 220th birthday. Join us on Sunday May 1st for coffee and cake in the museum library. A slide show presentation on the life of Horace Mann and his accomplishments will be running throughout the afternoon. 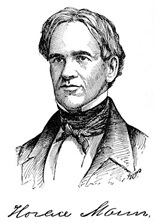 Horace Mann was born in Franklin, May 4th, 1796. With very little primary education, he was mostly self-taught and entered Brown University as a sophomore after testing so well on his entrance exams. He graduated at the top of his class and went on to study law. In his life time he was a lawyer, a legislator, president of the Massachusetts Senate and an advocate for the abolition of slavery and the care of the mentally ill. He was named the first Secretary of Education in Massachusetts and this is where is life’s work is most highly noted. He created the Common School and established that all children should attend schools supported and funded by the community. He believed that, in a democratic society, education should be free and universal, nonsectarian, and reliant on well-trained, professional teachers. It’s these basic beliefs that shaped the education system used to this very day. Franklin is proud to claim Horace Mann as our own. Later this year the town will honor him with a life size statue erected on the site of the former Horace Mann High School at the corner of Emmons Street and West Central Street. At the same time the museum will recognize another favorite Franklin resident who shares her birthday with Horace Mann, but as she notes, he’s just a little older. Stop in and wish Ellie Crothers a Happy Birthday between 1:00PM and 4:00PM!